If you’ve been on the search for recipes that won’t overextend your food budget, and are coming up with plenty of options, yet none of them sound quite so appetizing… We know, we’ve been there before. Cheapness usually implies less (or overly much!) flavor, fewer nutrients, and well, it is typically fast food to be more exact. But we are having none of that here! Even on a budget you can, and you should, go all out for creating the best possible dish in your price range. That being said, spices work wonders in a myriad of ways. Take Mexican food for example, we know it, we love it, and it has a way of bringing back some wonderful Taco Tuesday memories. The cumin, the chili powder, the paprika, garlic, tomatoes and onion – this exciting flavor combination gets us every time. 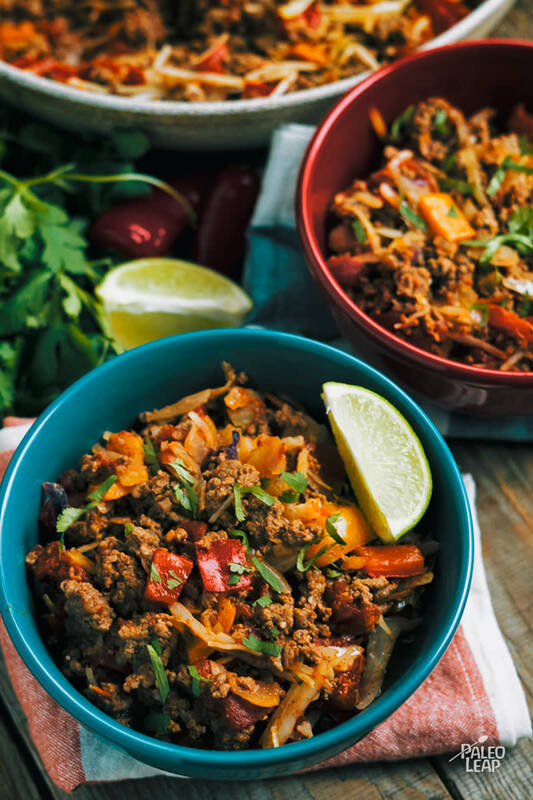 Before we start drooling, let’s add in some ground beef, and half a head of cabbage to fill the pot, cabbage is a Brassica you know, and you will want to include it in your weekly meals as much as possible – especially if you are watching your waistline, er – wallet. Corn tortillas are definitely out when it comes to eating right, but there is good news if you have another type of Brassica on hand. With a little preparation you’ll have a plateful of baked cauliflower tortillas ready in no time at all! Melt cooking fat in a skillet over medium-high heat. Add onion and garlic; cook 2 to 3 minutes. Add the ground beef and cook until browned, 4 to 5 minutes. Add the tomatoes and bell pepper, continue cooking another 2 to 3 minutes. Sprinkle with chili powder, cumin, paprika and season to taste. Pour in the tomato sauce, toss everything well and add the cabbage. Cover and cook on medium heat, 8 to 10 minutes or until cabbage is soft.